Culture: Murraya koenigii need warm temperatures with full sun to partial shade. We grow ours under 28% shade all year. We use a soil mix consisting of 1 part peat moss to 2 parts loam to 1 part sand or perlite. The soil should be allowed to thoroughly dry between waterings. Fertilize weekly during the growing season. Winter temperatures should not fall below 65°. Water very sparingly during the winter months and do not fertilize. Since it is a small tree it doesn't need repotting very often. Ours is 5 feet tall in a 2-gallon container at 8 years old. Propagation: Murraya koenigii are propagated by growing the small suckers from the base of the tree, by root cutting, or by seed. 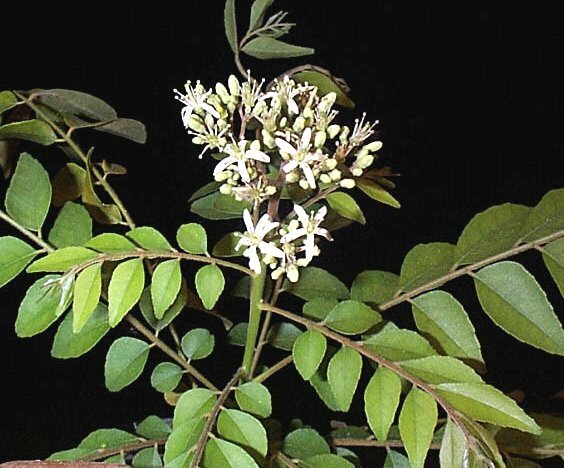 Murraya koenigii was featured as Plant of the Week June 8-14, 2001.